Dr. Cheryl Dabhi discovered that she is a gifted child, she could actually listen and converse with God / Angels / Jesus and more since childhood. She also sang soul song and had a healing hand. Her spiritual journey began quite early since her childhood. She had a very strong inclination towards spirituality, energetic healing and alternative healing. 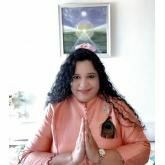 So she persuaded Doctor in Naturopathy Sciences and also became an energy healer in 1999, exploring different modalities of alternative and energetic healing ranging from pranic healing, reiki, theta healing, soul healing, angel therapy, tarot reading, angel reading, dousing, vastu, access bar, and much more. From many renowned national and international gurus. Dr. Dabhi got Enlightenment in 2013. During the Enlightenment experience, she was connected to Source/Paramatma/Nirakaar/God and she experienced god sitting in her heart (space where the heart chakra is rooted in the Meridian). During the 1.5 months of trance state, she was worked upon by the divine and given a vast knowledge of spirituality. A healing technique named "God's Love" was imparted to her. During this interaction with source/god, Dr. Dhabi was taught how to connect people to god and was told that this is her Life purpose. Dr. Dhabi is now continuously connected to a source and receives information from the source. In samadhi, she channels God's Love healing 24x7 since the time of her Enlightenment. "Thank you, Dr. Cheryl. The Midbrain activation you did for my one and half-year-old grandson has really shown good results. Within 3-5 days of activation, he started walking properly and there is the improvement in his eating also. Children with delayed milestones or other issues should try the midbrain activation under Dr. Cheryl. Thank you once again."